To say Kaia Gerber, age 16, is genetically blessed is an understatement. Her flowing brown locks, high cheekbones, and deep brown eyes mean one thing: it’s all in the genes. Cindy and Kaia Crawford are bound to turn heads at any party they face. At the Balmain x HM party, Cindy and Kaia were extra fierce; Kaia in a patterned bodycon dress and Cindy in a sharp blazer. From uncanny Instagram selfies to red carpet photos, the mother-daughter duo can be seen rocking their inherent supermodel struts anywhere. There’s no denying that actresses Lisa Bonet and Zoe Kravitz could pass as sisters with ease. The support between mother Lisa Bonet and the Big Little Lies star is unquestionable – even their outfits out complementary! The pair is known for donning lighthearted bohemian style by day, and fitting glam looks by night. Who else is taking bets that they share closets? What’s the secret to raising a family of supermodels? Just ask Yolanda Hadid. Yolanda recently debuted her Lifetime show, Making a Model with Yolanda Hadid, where she shares her trade secrets on beauty-filled motherhood and gives tips to young aspiring models. From the crib to the catwalk, Gigi and Bella were raised to be two emerging fashion icons of the decade. Harper, the youngest child from Victoria and David Beckham, has her casual weekend style down pat. Often seen walking in stylish flats or laidback athleisure wear, Harper can be found bustling through the streets of London with her fashion designer mom. Victoria Beckham, a mother of four, never takes a day off from her chic wardrobe. We bet Harper has the best time playing dress-up in their Oxfordshire home. By now, 4-year-old North West is used to posing for the camera and working her best angles. She’s grown up around the Keeping Up with the Kardashian’s camera crew thanks to her ultra-famous family. With a palace built of influence, North is a princess-in-waiting as she follows in the footsteps of the stylish Kim Kardashian West. And like Kim, she wouldn’t miss an opportunity to rock identical mommy-and-me style whenever she has the chance. Beyoncé brought us Destiny’s Child, Lemonade, ‘Beychella,’ and so much more. She doesn’t fall short on anything she creates, including her children. 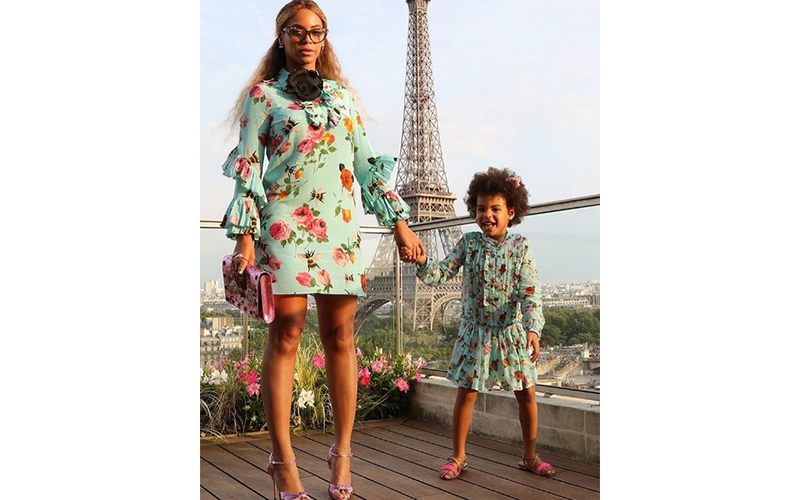 Blue Ivy, daughter of Jay-Z and Beyonce, is the spinning image of her mom on most occasions. From twinning in matching Gucci dresses in front of the Eiffel Tower to slaying the red carpet at every award show, the two are irresistibly American sweethearts.